Covered in solar panels and made from a wooden frame, it would be hard for these tree-shaped homes to get any greener. This housing plan could make living in the ‘burbs a joy. Konrad Wójcik thinks a little urban sprawl could be a good thing. The Denmark-based architecture student has reimagined how people might live outside cities–away from noise and pollution, but without any of the environmental impacts of typical suburbia. His solution: Tree-shaped houses packed with every conceivable sustainable design element, located in the middle of a forest, but within biking distance from a city. Wójcik’s conceptual design tries to use the same principles. One side of the pine-shaped house is covered in solar panels. A heat pump takes in more energy from the ground, and a bio-digester turns any waste on site into even more power. Huge windows reduce the need for electric light and bring in fresh air. Since Wójcik wanted the house to have virtually no environmental footprint at all, he chose not to use any cement or steel in the construction, and instead engineered a lightweight wooden frame that’s strong enough to support the entire house. A timber pole runs up the middle of the home like a tree trunk. Everything inside, from walls to furniture, is made from fully reusable materials. 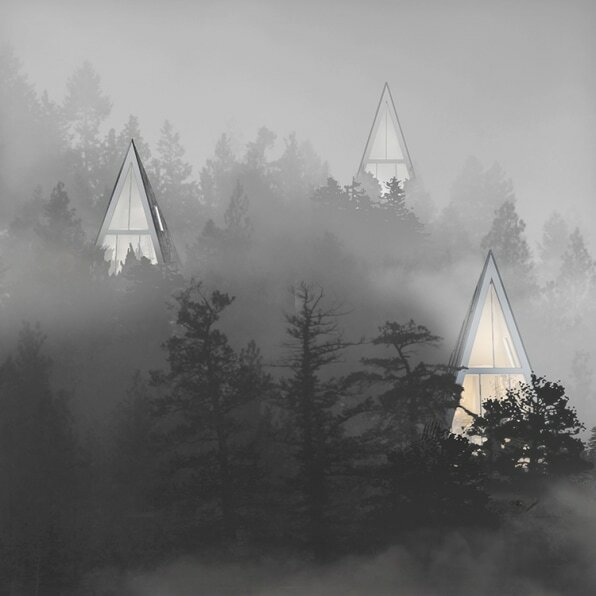 In Wójcik’s plan, the houses would be laid out in a forest with enough distance between each unit that they would be basically invisible from the others. Can something that’s so sprawled out actually be sustainable? After all, the massive carbon footprint of the suburbs mostly comes from transportation, not the way houses are built. Wójcik thinks it’s possible to keep transportation minimal by locating the development close enough to a city that walking and biking is possible. He also intends for it to be built near an existing road with public transportation. Of course, many cities might not necessarily have a nearby forest that meets these criteria–and even for those that do, only a tiny fraction of the population could be accommodated in a development with so few homes. Still, Wójcik plans to continue pursuing the idea and has had interest from buyers around the world. The biggest challenge, he says, is not engineering the structure–despite its complicated shape–but implementing so many sustainable technologies within such a small space. The next step is finding a developer that’s willing to take a risk on something new.